published Nov 28th 2018 by markymark. Conditions skied: Hardpack, spring slush, granular slush, street, and rain. As sunny days and spring laps unfolded at the glorious Mt. 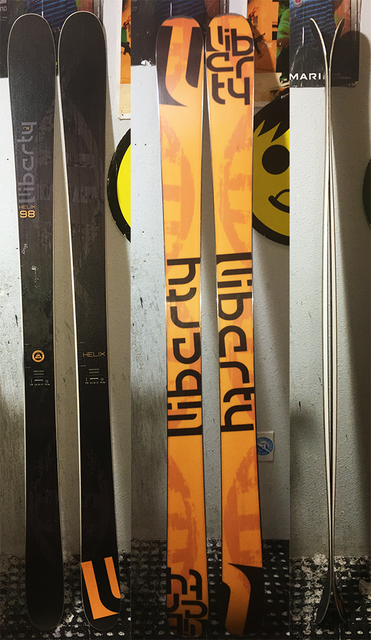 Hood, the next ski in my review lineup was the Liberty Helix 98. Over the past 10 years, Liberty has made a mark for themselves in the all mountain, freestyle, and park skiing game. The Helix 98, bringing the famous name back, is aimed at the versatile, wider park/all-mountain ski market. For the Helix, Liberty went with a sleek black & grey topsheet, with and underlaid DNA graphic when both skis are put together. The orange highlights pop in contrast to the black and grey and I think the skis look great. The orange bases also show up really well on photos. I was able to test the Helix in late spring, in the various ever-changing conditions on Mama Hood, and I’ve been skiing them early this season on street and pre-season setups too. Liberty describes the construction as a ‘speed core’, which actually translates to a bamboo/poplar laminate. The Helix 98 is middle of the road in width, like many all-mountain/freestyle skis these days, coming in at 98mm underfoot and widening out to 133mm in the tip and 121mm in the tail. The Helix 98 also offers a stiffer profile than most wider park/all-mountain skis these days, giving the ski a ton of energy, stability, and liveliness. Hand flex I’d say is around an 8.5 out of 10 and the on-snow flex is slightly softer, maybe a 7.5 to 8 after the first few days. Right, enough of that, let’s get down to the important business: the on snow performance. With fairly minimal rocker, plenty of camber underfoot and a full sidewall construction, this ski provides a responsive feel while maintaining great edge hold in various different conditions. The rocker in both the tip and tail gives some relief from the fairly stiff flex, allowing for easier turn initiation, as well some playfulness, even when skiing at slower speeds. The ski had a really nice, slightly surfy feeling when thrown sideways too, leading me to believe it would be good in powder too. Despite primarily staying in the park while at Hood, the Helix was dominant while bombing early morning Palmer laps on ice, crud, and slush all in the same run. The camber really gives you the grip you want carving, and thanks to the flex it plowed through crud and ice with ease. The versatility really surprised me, the shape and construction of the Helix 98 made it a power machine, allowing the skier to not only get around the hill but to push limits and charge hard, making it a great option for all-mountain skiers, much like the K2 Poacher. Although the Liberty Helix 98 looks like a more all-mountain shape, it 100% performs when you enter the park. The stiff cambered section ensures grip and creates a ton of energy (pop) when taking off on jumps and holds stable when landing on big features or slightly flatter landings. In fact, I found this ski performed its best when hitting large to medium size jumps. Since the ski was an 8 on the flex scale, landing deeper on jumps caused little to no washout on larger features. If you tend to carve off the lip, this ski has great edge hold, eliminating chatter. 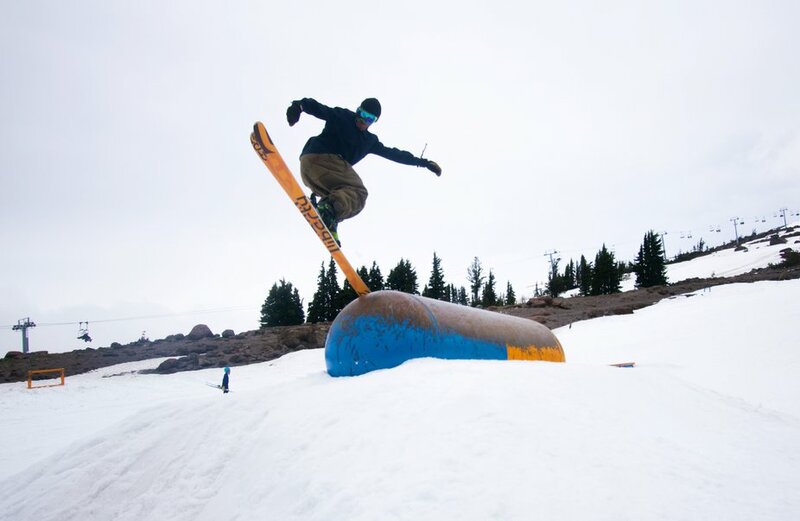 The pop from the camber underfoot allows you to get great takeoffs, even when conditions are super soft in the spring and the lips are blown out in the slush. It blew my mind how well these skis crushed through the slushy lips when taking off switch. Landing switch felt okay too, despite the slightly less than full twin. However, if you’re spinning on big jumps you’re going to want to rotate fully because landing short will cost you, especially in slushy conditions, because these are not a forgiving, surf-it out kind of ski. One thing that really defines the Helix, much like the other Libertys I’ve skied in the past (Transfer), is how light the skis are. They feel quick on snow and have super-low swingweight, despite being a wider ski, making them very ideal for spinning out of rails and spinning fast off jumps. I really enjoyed this aspect of the Helix because I enjoy technical tricks. Combine that with a 98 underfoot it provides and you have a wide base to hit rails but still a ski which allows for quick swaps, spins on and off. As with jumps, the Helix is most ideal on big rails at places like Keystone or Breck where you can hit them at higher speeds and have bigger landings. As far as butters and presses go, the Helix is not the most ideal, with shallow rocker in the tips and tail plus the stiffness, it makes you really put a lot of effort to getting on your noses or tails to press. Normally I like to do tail butter 2s onto rails but I found this ski I had to put all my weight into to even attempt that trick. Thanks to mother nature granting us some early snow this year, I was able to introduce the Helix to some handrails, stair sets, and cement in the street. To my surprise even after hitting a street rail 30 something odd times, not a single edge crack, core shot, or delam in the tip or tail. The lightness of the ski allowed for easily spinning on and out which is beneficial when hitting spots that are in tighter quarters. I was blown away that this ski held up like it did beating it around in the street like rate I did for a couple of pre-season days. Just another reason why the Liberty Helix proves to be a superior ski on and off hill. The incredibly variable Pacific Northwest weather meant that I skied the Helix in many conditions. The Helix was really fun when crushing morning hardpack and granular ice on Palmer with nice edge hold and a decently tight 19,5m radius for turning at high speeds. By contrast, I also skied the Helix in mostly hot spring slush days at Mt. Hood consisting 70- 80 degree days and extremely wet slow snow. The small amount of rocker was less ideal than more rockered skis, but I really enjoyed how the stiffness allowed me to power through slushy patches maintaining speed throughout the park. Like I’ve mentioned in previous reviews, stiffer skis sometimes mean a higher risk of catching a snow snake, making slush days harder to ski and though the rocker helps, that is still somewhat true here. Since I tested the Helix 98 in the spring on the glacier, I didn’t get to ski the Helix in any powder. But as a whole, a ski like the Helix is a great daily driver for me because the conditions on the East Coast vary widely, one day you can be skiing 6 inches of fresh and the next day hardpack groomers. With the Helix, you can go from crushing tree lines with buddies in the morning to skiing park for the second half with ease. So how durable is the Helix? In the past, the only Liberty I have tried is the Transfer, which was one of my favorite skis to date, but also the only ski in my career that I have broken in half. But the Helix was much different for me, even 3 years later skiing much harder and faster. The first two skis I reviewed this year blew apart in 5 to 8 days of skiing park and all mountain. But to my surprise, even after 12+ days on the Helix, the edges on all 4 sides of my ski are still holding together and only experienced minor dents when slamming into rails from hard angled take offs. I’ve skied some street on these too and they are still going strong. The full sidewall construction means you definitely get some damage to the topsheet, but so far, nothing more than some aesthetic wear and tear which is expected when skiing park. This didn’t affect the skis performance and wasn’t anything a little epoxy couldn't fix. The Helix has also maintained its stiff flex so far, sustaining great pop and quick response. It’s hard to give definitive answers on durability in the review window, but it certainly seems that Liberty has put more effort into making their park skis more durable. In short, I found these skis pretty bombproof. I’d say that the Liberty Helix 98 is a ski that performs on all-mountain almost as well as it dominates the park. 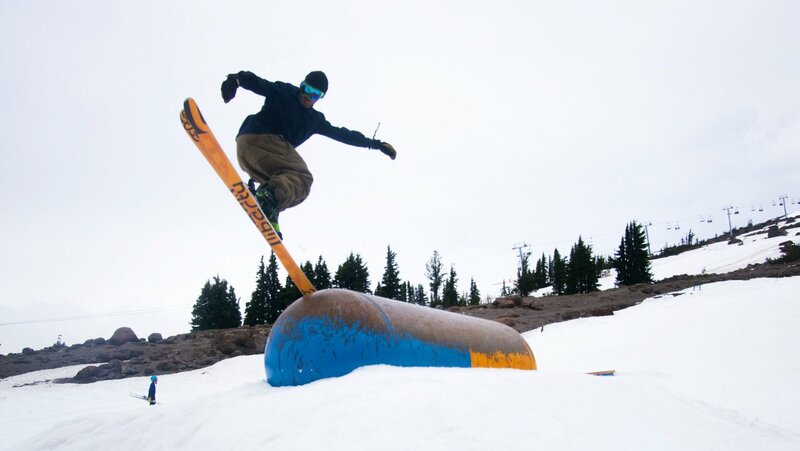 For an advanced park skier, this ski provides a super-durable, energetic, stable, and lively platform. The shallow rocker in the tip & tail helps with lightening up the stiff flex giving a slightly looser feel but this is a totally different ski from most circa 98mm jib skis like the Blend and EDollo. It’s stiff, stable and works best for skiers who like to charge, be it big rail features, large jumps or blasting all mountain natural hits. I wouldn’t recommend this ski to anyone one who is a beginner to intermediate skier because they would have trouble with the stiff, non-forgiving ski while learning new tricks. The Helix is 100% a very versatile ski. 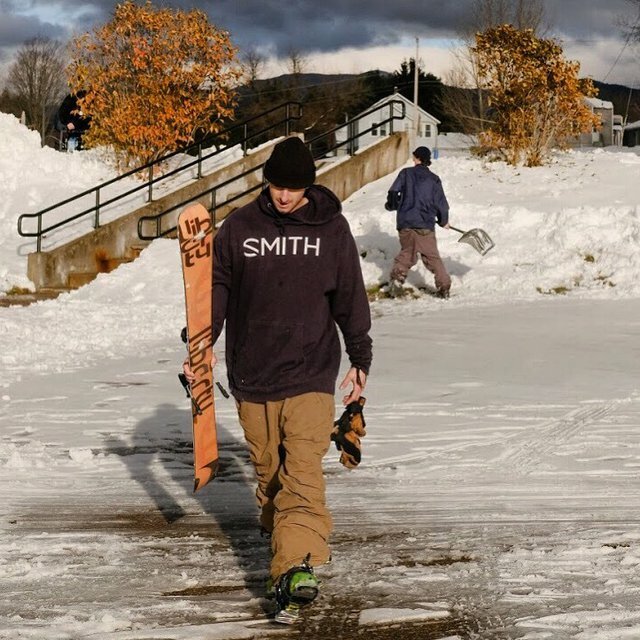 The Helix 98mm is the perfect ski for the everyday variable conditions that the east coast will throw at you: hardpacked ice one day and the seven inches of snow the next and lots of park sessions. I personally loved the Helix for my aggressive ski style and I really enjoyed the wider 98mm platform because it gave me more ski to work with on rails. The stiff camber allowed me to charge jumps, with the super low swingweight made it easy to go big & spin fast. The hint of rocker felt great too when carving trails and skiing slushy days. I had great luck with durability too. In fact, I enjoyed these skis so much so that I made them my Editors’ Pick for the park.